Some of you reading this are probably very excited and some of you a probably very confused – so let’s make sure we’re on the same page. Chow Mein, (also sometimes spelled Chao Mein, and often pronounced by some native Spanish speakers as “Chow Ming”), is best known as a noodle dish from China. Many people don’t realize that just as we have our Americanized versions of Chow Mein in the United States, there are well-loved versions of the dish all around the world, including in Central America. Guatemala in particular has a great love of Chow Mein. 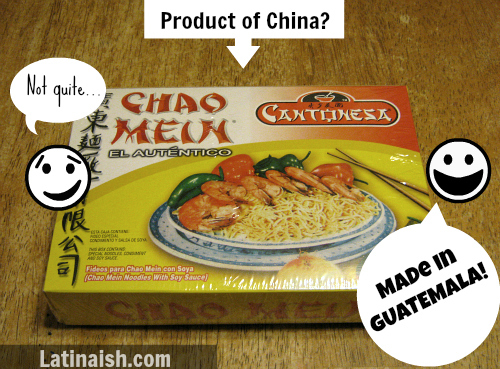 This do-it-yourself box of “Chao Mein” (pictured below) is a brand commonly found in Latino Markets here in the U.S., and it’s made in Guatemala. Chow Mein is also a favorite in neighboring El Salvador, and ever since I’ve known Carlos, he has loved Chow Mein, and Chinese food in general. On our first date we spent the entire day together. For lunch we ate at a hamburger place but for dinner, (yes two meals together in one day!) Carlos wanted to go out for Chinese food. As we were waiting to be served at the Chinese restaurant, two waiters were standing nearby having a conversation in Chinese. Carlos jutted his chin in their direction, “Entiendes lo que dicen?” [Do you know what they’re saying?] he asked me. “No, no hablo Chino,” I responded perplexed. “Yo sí,” he said, smiling, and then he proceeded to invent a translation of the waiters’ conversation. I wasn’t convinced, but as you know, we soon married anyway. Years later Suegra moved in. When Suegra lived with us and we would go out to eat, we often ended up at Chinese buffets because it was the one cuisine she wouldn’t complain about. I never ate so much Chinese food in my life until I married a Salvadoran! So, with that being said, here is my version of Salvadoran Chow Mein, which is basically the same as Guatemalan Chow Mein, although families each have their own unique way of making it. • It’s not necessary to buy the box of “Chao Mein” noodles pictured above. The box contains the noodles, a little packet of soy sauce (not nearly enough for my recipe), and 2 seasoning packets which I discarded because they contain MSG which I avoid. You can buy any Chow Mein Stir Fry Noodles. You may need to buy 2 packets of Chow Mein noodles depending on the size of the packages. You’ll want about 12 ounces to feed a hungry family of six people. • This recipe is very flexible, feel free to try different vegetables and to increase the vegetables to make it healthier. You can also replace the dark meat chicken with chicken breast meat, steak or shrimp. I used green onions because that’s what I had on hand, but any type of onion you like can be used. • For those who aren’t familiar, chayote (“güisquil” to Central Americans), is a type of squash, usually light green in color and about the size of a fist with one puckered side. The flavor is very mild and pleasant. To use chayote in this recipe, wash it and then julienne it, (i.e. cut it approximately into the size and shape of matchsticks or shoestring-style french fries.) You do not need to peel it but there is a small white seed in the middle you should discard. • You can use sesame oil or canola oil for frying. I like to use equal amounts of both. The sesame oil gives it a nice flavor which helps make up for the fact that I discard the “condiment/flavoring” packets. 1. Prepare all vegetables while the chicken cooks. Put the vegetables in a large bowl together and set aside. 2. Prepare chicken (see notes above), and then set aside. 3. Bring a large pot of water to a boil. Put the noodles into the water and cook about 5 minutes until al dente, being careful not to overcook them. 4. Remove the noodles to a colander to drain. Set aside. 6. When the oil is very hot, add the vegetables, and stir them continuously for one to two minutes. 7. Add the chicken and continue stirring for another minute. 8. Add the noodles and continue stirring for another minute. 9. Add 1/3 cup soy sauce, stir and remove from heat. thank you thank you, I am making this tonight. I have leftover rotisserie chicken, a lonely guisquil in my veggie drawer, and i’ve had that same brand of chow ming in my pantry for months. I don’t have green onions but it’ll be alright without it. Dinner is planned! It’ll turn out great even without the onion. Throw some other veggies in there, it’ll work :) Let me know how it goes! There are Indo-Pak versions of Chinese food also. Many South Asian people I know don’t like the Americanized version of Chinese food, nor do they like more authentic regional Chinese foods, but they *love* Indo-Pak Chinese. I have come to enjoy it as a genre of cooking, too. Since coming to NoVa I have seen a lot of Peruvians here and learned of chaofa and their specific brand of Chinese food peruana. I read that this evolved from Chinese settlers in Peru. Do you have any idea of the history of how Chao Mein came to Central America? I had a friend in school who was Panamanian American and part Chinese…she said there were Chinese in Panama…is it the same for El Salvador and Guatemala? Or did this spread from other Latin American countries or perhaps the US? I guess the chayote and achiote give it a special local touch. I knew it couldn’t be just my husband and his brother that were crazy about Chinese food!!! My cunado has taken me to some really questionable Chinese buffets…..but we have a local Chinese restaurant that is FANTASTIC. The manager knows us by name and most of the waiters already know what we order. One waiter doesn’t even bring us menus anymore. I think it’s safe to say we go there at least 3 times a month, and that’s okay because the cashier always gives us extra stamps on our punch cards. The questionable Chinese buffets are never a good idea LOL… I’ve experienced a few of those too. What I love most about Chinese buffets is seeing how many Latinos are making the food jajajaja … The last Chinese buffet I went to had platanos fritos! Yep, definitely had these in Central America! In Peru as well where “chifa” (Chinese-Peruvian cuisine) is widespread. Funny how different countries reinterpret Chinese food. French love “nems” (Vietnamese spring rolls) and “Cantonese rice” (stir-fried rice), while American and Canadian like “kun pao chicken” or “egg rolls”… and none of that really exist in China! Zhu, have you ever read The Fortune Cookie Chronicles? It talks about the origin of Chinese food and how it’s re-invented itself around the world. I read it years ago. I wonder if Central America was covered in it! It’s been so long since I read it, but it was good. Durante las décadas de los 30 a 50s hubieron comunidades Chinas las cual desaparecieron debido a las emigraciones a los USA y Canada y la otra razón muchos de ellos se casaron con Salvadoreños. Duarante mis años de bachillerato tuve un compañero llamado Agustin Fong pero ni los ojos parecían asiático, nos contaba que su abuela y abuelo llegaron the Hong Kong allá por los años 40s. En la actualida exciste Asosiacion Centro Chino de EL Salvador, la cual a solicitado al gobierno que declaren el día de la etnia China el Salvador. Existe como 5000 Taiwaneses y chinos de la China continental. En el Salvador se producen las ordenadoras ACER y los telefone movibles HTC que son compañías Taiwanesas. Muy interesante la información que compartiste. Mil gracias, Joe. Oh, I love this– Central American Chow Mein– My husband is Guatemala and I’m from California but we live in Guatemala. My first experience eating chow mein here was with tortillas! Asi es la vida…I mean doesn’t everything go with tortillas : ) Fun to find your site! Mi esposo wants “Chop Suey” for Valentine’s so your recipe helps me fill in some gaps for how to make this “Honduran” recipe for him. Gracias y Buen provecho!! Yay – have a tasty Valentine’s Day dinner! My family is from el salvador and my husband is from guatemala we make it the same way only in guatemala they add chicken, steak, and shrimp (at least my mother in law does) but they add ketchup (gasp) i think they kill it lol. But thats tradition in Guatemala i guess. They also eat this with tortilla chips or tostadas. I will try ketchup added to almost anything at least once LOL. I love ketchup. Hi Diana, most supermarkets (and even WalMart Super Center) typically has them under the English name “chayote.” They are in the top of the refrigerated produce section a few feet down from jalapeños, kale, and eggplants, usually. Suerte! I think that chayote is a spanish word. I wonder what it is in English. We love it in caldo de res. The recipe looks good. I wonder if maruchan noodles are too soft for this recipe. Maybe if I don’t cook them the whole 3 min…..
I’m Guatemalan. I was looking for chao mein recipies on pinterest to not make the same kind of central american stuff, to try sth new you know. The first result was this, oh the irony. I’ll take this as a sign to make the same beloved recipe today! Haha, that’s hilarious! Hope you enjoy your meal.